Assassin's Creed II is definitely one of my favourite games of the last 12 months. It was a meaty gaming meal that took several steps towards fulfilling the promise of the original, with new mechanics, more variety in gameplay, and an alluring new setting: renaissance Italy. It was a big leap, in other words: a worthy sequel in all regards. Brotherhood, on the other hand, will have a slightly harder time proving its worth. Rather than moving to a new time period, it continues directly on from the events of Assassin's Creed II, only with the action shifting almost entirely to Rome. Like previous titles, there's also a modern-day component. 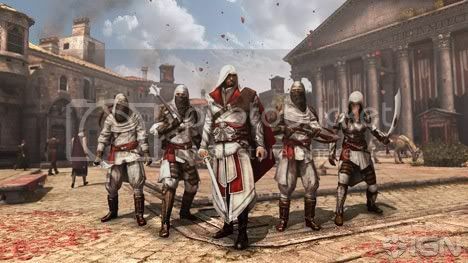 The game is once again framed by the on-going battle between the Templars and Assassins, and players are actually assuming the role of Desmond, who lives in the present day and is able to experience the memories of his ancestor Ezio using a device called the animus. The game cuts between the two time periods but the bulk of the gameplay occurs in renaissance Rome. Rome is impressively varied, from bustling city streets to citadels, ancient ruins and landmarks like the Coliseum. 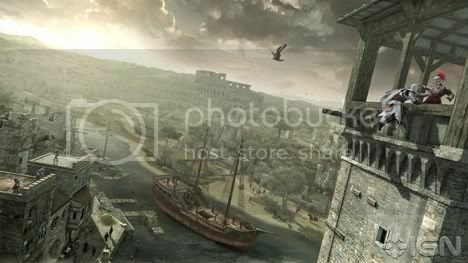 It's important to note that while the Borgia towers are a key element of the game's structure, they're not actually central to taking down Cesare. You can actually finish Brotherhood without destroying all the towers. Instead, they're about earning income, unlocking items, gaining apprentice assassins and reducing the presence of Borgia guards across the city. By destroying a tower, players can make missions in that region easier for themselves by ensuring there'll be less guards around. How to get to each Captain? Well, that's up to you. Each tower is surrounded by a compound where the guards are on high alert, so it's up to players to work out the best path to the Captain. Easier compounds allow astute players to clinically execute the Captain with little-to-no danger, while more difficult ones will inevitably result in a huge confrontation, or have a more difficult path to the end goal. As fans of open-world games would expect, a lot of the player's time will be occupied with missions and activities that don't necessarily advance the plot. It's easy to get sidetracked for hours finding treasure chests, taking on assassination contracts, doing missions for the various guilds or trying to level up your relationship with them, exploring the world or climbing landmarks like the Coliseum. Subterranean environments return too, in the guise of Sons of Romulus missions. These make for a nice change of pace, as the focus is very much on movement puzzles over combat. ¿Quienes tienen pensando comprar el juego? Es un hecho que el juego va a estar increible, los invito a que apartir del Jueves 18 de Noviembre, pueden ir a Lan Zone, a probar el juego! Assassins Creed: Brotherhood Original XBOX 360!! Barato!